When I first learned about Eratosthenes from some long-forgotten astronomy book in my youth, roughly age 10, I fell in love with the name: Air-uh-TOSS-the-knees. I’ve always enjoyed pronouncing long words and names like that. Once I had the name down pat, it wasn’t too difficult to attach meaning to it. And once I knew what he had done more than two thousand years ago, I was amazed. Two things about Eratosthenes impressed my pre-adolescent self. First, when my fourth grade teacher was teaching the class that Christopher Columbus had to argue with a group of flat-earth scholars — that the world was round and he wouldn’t fall off the edge if he sailed west — I knew that school lesson was bunk. Scholars had known the earth was round for more than a thousand years by Columbus’s era. In truth, they were debating how big it was and how long the journey might last. Knowing that Eratosthenes (and others) had already measured it gave me my first sense of skepticism. The teacher and the school book were wrong. I never completely trusted a source again. Teachers, experts, supervisors, issue advocates, politicians, judges, and all other authorities are fallible. Be skeptical! Second, Eratosthenes helped me realize the power of reasoning. Consider how you would measure your waistline. You’d use a tape measure, right? 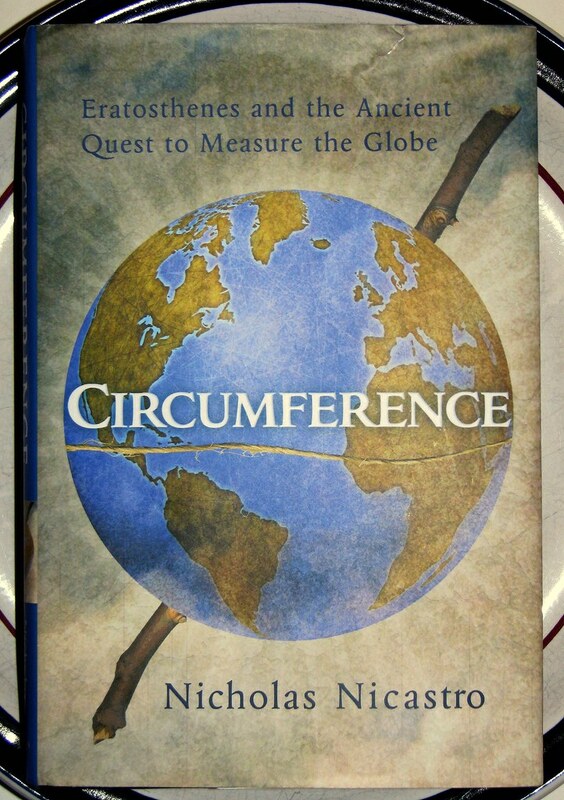 Now, imagine how you would measure the circumference of the planet. Is your tape measure long enough? Are you prepared to swim great distances? Do you have the time? Eratosthenes, a librarian in Alexandria circa 200 BC, measured the earth using only shadows, angles, and math. He was brilliant to conceive the experiment, and despite feeding a few errors into his calculations, he was remarkably accurate, too. Columbus actually low-balled his 15th century circumference estimates because he hoped the world was smaller than Eratosthenes figured. Eratosthenes’ estimate for the distance between the Earth and the Sun was remarkable, as well: it was magnitudes greater than others’ guesses … and reasonably accurate. These thoughts came to mind while reading Circumference, and new book by Nicholas Nicastro. Precious little is known about Eratosthenes himself and most of his work is known to us only from the surviving texts of other ancient writers. Nicastro compensates for that by filling his slim volume with information about the world in which Eratosthenes lived. You could easily read about Eratosthenes’ ingenious method in five pages or less, but Nicastro describes the politics and culture of Alexandria, the famous library in which Eratosthenes worked, and the state of geodesy (the science of earth’s size and shape) since his time. I grew impatient with the political “fluff” at times, but those sections (which I read through quickly) might be enjoyable to readers more interested in Egypt and Greece. On the other hand, I savored the discussion regarding western civilization’s developing concept of geography and places still unknown. This book was a quick and pleasant read. I read it, ironically, during a transcontinental flight when I could see the curvature of the earth out my window. How might Eratosthenes enjoyed seeing that?